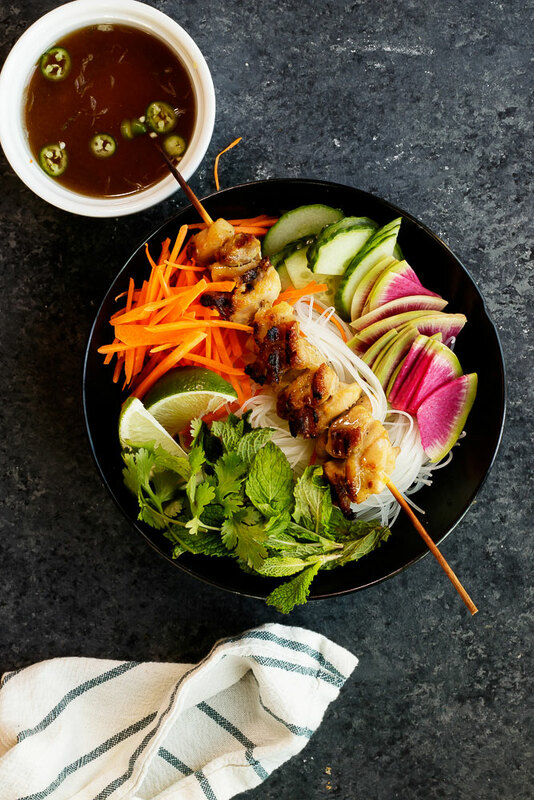 The dipping sauce is inspired by the Vietnamese sauce nuoc cham but you could always use the peanut sauce from this recipe. In a medium sized bowl combine the chicken, coconut milk, fish sauce, garlic, and minced ginger. Cover with plastic wrap and refrigerate for at least 30 minutes or up to overnight. Make the nuoc cham sauce by placing the chili, garlic and sugar on a cutting board. With the back of a knife mash the ingredients together. Top with water, limes and fish sauce. Stir well and let cool. Thread the chicken onto skewers and grill the chicken on the stovetop (or use the broiler). Cook for about 9 to 11 minutes, flipping halfway through if using a grill pan or until an internal meat thermometer reaches 165°F. Assemble the bowls by placing the noodles in a dish. Top with cucumbers, carrot, herbs and chicken. Drizzle some dipping sauce over the top then sprinkle with herbs and chilis.